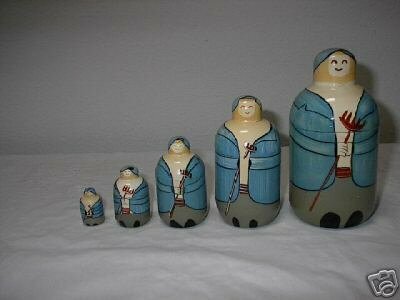 Unusually shaped nesting dolls have bottle shaped bodies and small heads. The dolls are peasants or farmers dressed in blue coats and caps and holding rakes. They are somewhat crudely painted. The five piece set ranges in size from 5¾” to 1”. This set was possibly made in China.